Vistaprint: $7.99 Personalized Stockings + Stuffers with FREE shipping! If you are looking for a cute personalized stocking, head over to Vistaprint. It’s not too late to get one in time for the holidays and they start at only $7.99 with FREE shipping. They also have several cute stocking stuffers for you to choose from too! Head over to Vistaprint to check out this offer and more fun Christmas ideas. I ordered these labels last year for my holiday cards. We will be using them again this year too! Since you get to customize these labels, you can use them as gift tags, school tags, or return labels. The labels are completely FREE, you just have to pay shipping and processing! Shipping starts at $3.03. Head over to Vistaprint and get started on your FREE labels! This offer will only be around for two days! Offers Nov 16, 2011 in free, holiday, VistaPrint · Expired! 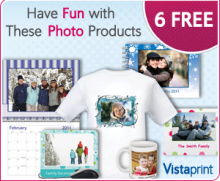 Vistaprint: 6 FREE offers! Perfect for the holidays! 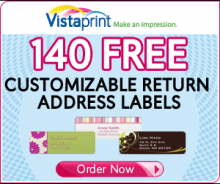 If you missed the free labels yesterday, Vistaprint has come out with another offer. Now through September 30th, you can get six free items from Vistaprint. You will just need to pay shipping. Select a photo flipbook, t-shirt, mug, mouse pad, magnets or calendar for free. Vistaprint has made it even easier to upload photos. You can take them right off Facebook, Picasa, or your Flickr accounts. These make perfect holiday gifts too! Shipping prices range from $4-$6 depending on the product. Head over to Vistaprint and check out the new free offers! 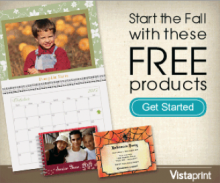 Offers Sep 28, 2011 in family, free, VistaPrint · Expired! This is by far one of the best freebie deals out there! 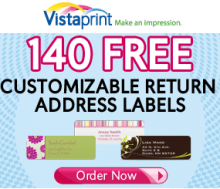 Vistaprint is offering a one day deal today, you can get 140 FREE labels! The great thing about these labels, you can use them for just about anything since you get to customize them. I ordered holiday labels last year but I think this time I’m going to get labels for Em’s preschool items. We’ve already lost several things! Head over to Vistaprint and grab this one day deal. You will need to pay shipping which starts at around $3. Offers Sep 27, 2011 in free, household, VistaPrint · Expired! Vistaprint has a great offer going on this week. You can get 6 FREE products for fall! The products are FREE, you’ll just pay shipping and processing fees which are starting at around $4. Head over to Vistaprint and check out these cute and fun fall items! I know this offer is just for me! I actually went to Vistaprint yesterday to order return labels but never go to complete my order. I’m so glad I didn’t because today they are offering FREE address labels! Since you get to customize these labels, you can use them as gift tags, school tags, or return labels. The labels are free, you just have to pay shipping and processing! Shipping starts at $3.03. Head over to Vistaprint and get started on your FREE labels! Offers Jul 26, 2011 in free, household, VistaPrint · Expired! 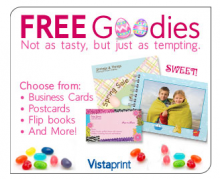 Vista Print: 6 FREE Easter Goodies! You all know how much I love Vista Print. I’ve ordered so many great things from them for FREE. I’ve just paid the shipping and handling fees. I can tell you, I’ve never paid more than $6 for any of my orders. Right now they have a great Easter promo going on. You can get 6 Easter goodies for FREE, just pay shipping! They have business cards, pens, note cards, stamps, and even a cute 4×6 flip photo book. Head over to Vista Print to check out this great offer. FREE personalized Valentine’s Day gifts from Vistaprint! I’ve always been a fan of Vistaprint. I’ve got a Halloween treat bag, mommy cards, and the cutest holiday return labels, all FREE. I’ve just had to pay shipping, which has never been more than $6. If you want a cute personalized Valentine’s Day gift, head over to Vistaprint. They are offering so many items for FREE. Just pay shipping! Vistaprint is offering FREE Holiday Labels! Convenient self-sticking labels are useful for letters and packages, or to label books and other items. Add your very own cartoon family with caricatures-even include your pets (that’s what I did anyway!) The labels are FREE-just pay shipping and processing (starts at around $2.95). Get your FREE labels from Vistaprint now!